Your one source for mobile payment acceptance solutions. 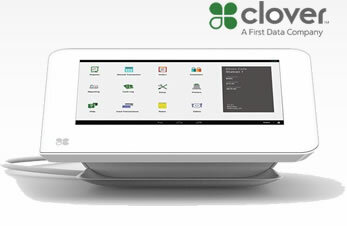 Sign-up for our newsletter and for the latest Clover product news. Clover Mini is the most advanced payment terminal on the market. It's a sleek, modern smart terminal. It accepts virtually all payment types and has the ability to scale up to full point-of-sale (POS) functionality. Clover Mini is an innovative smart terminal that can manage your entire business with downloadable apps from the Clover App Store..
Clover Mini is the sleekest, most innovative and flexible payment terminal around. Keep it simple by accepting payments or download optional apps that can help manage your entire business—Clover Mini can handle whatever comes your way. Clover Mini is compact and powerful, not only that, but it looks good too. It accepts virtually all payment types and has the ability to scale up to full point-of-sale (POS) functionality by downloading optional apps. As you grow, it can too with specialized apps. Accept more payment types, from magnetic stripe, EMV® chip, standard credit and debit cards to contactless payments, without additional equipment or software. Increase customer loyalty by setting up a digital loyalty and rewards program and keep customers coming back for more to increase business. Insights reporting turns data into information by tapping into valuable reports about your customers, what they buy so you can grow your business faster. Helps keep your customers information safe with built-in fraud protection from the TransArmor Solution. Runs on cloud-based software so you can access your information from any device. These materials were prepared by Ignite Payments Vermont, an independent sales agent for Ignite Payments, LLC. All trademarks, service marks and trade names referenced in this material are the property of their respective owners. Ignite Payments, LLC. is a registered ISO of Wells Fargo Bank, N.A., Concord, CA. American Express may require separate approval. Ignite Payments Vermont is a contracted Reseller of the First Data (and/or Clover) solutions. This webpage (or website) is not an official page of First Data Corporation, Clover, its subsidiaries or affiliated businesses.